The Scream is one of the most famous pieces of art created by Norwegian artist Edvard Munch, who made four different versions of it using different media like oil paints, tempera, and pastels. The painting shows a person with an agonized expression and a tumultuous sunset at the background. The landscape at the background is the Oslofjord near Oslo. 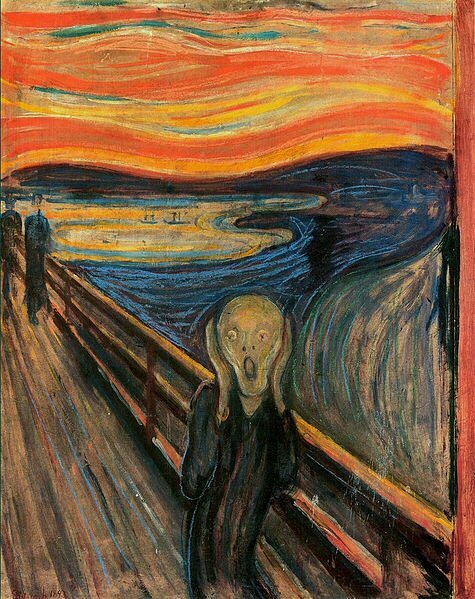 Munch based it's painting on a traumatic experience he had. When walking back to Oslo with his friends Munch paused, feeling exhausted. He got affected by the landscape, felt anxious and sensed a scream passing through nature.